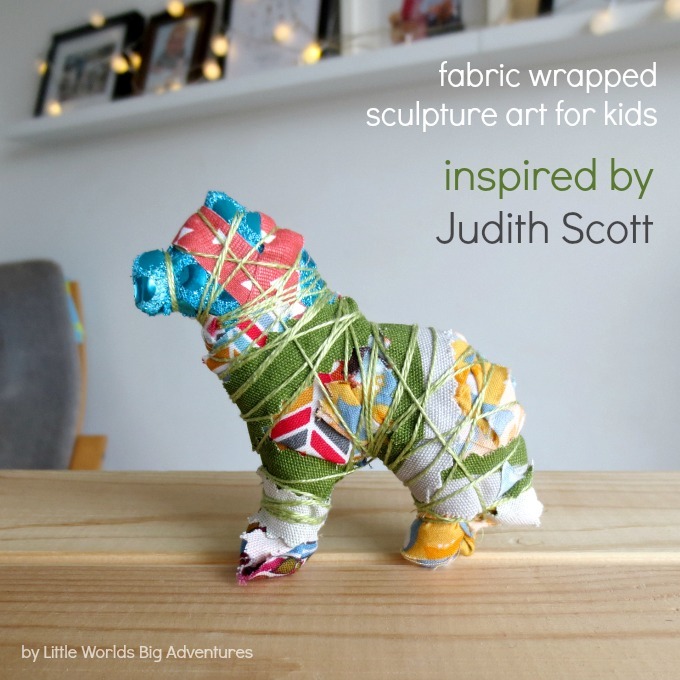 The story of Judith Scott and her beyond amazing textile sculptures is one you’ll want to tell your art loving children. It’s an inspirational story of a woman with Down syndrome that empowers people to find their own creative voice. 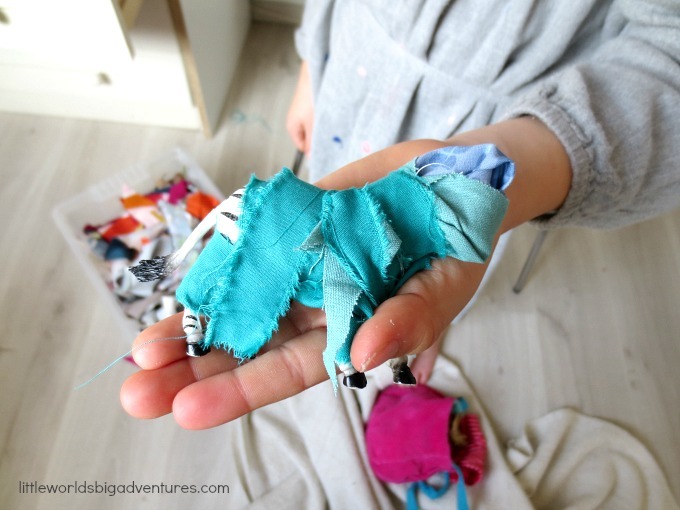 This beautiful fabric wrapped sculpture art for kids activity is one that takes you outside of the traditional art world and into the world of outsider art. Judith and her twin sister Joyce were born in Ohio in 1943. Judith, unlike Joyce, carried the extra chromosome of Down Syndrome. At the age of 7 she was sent to an institution for the disabled and discarded where she went on to live for over 20 years. In 1986, her twin sister Joyce took it upon herself to become Judith’s legal guardian and took her into her home. Judith started attending the Creative Growth Art Center in Oakland where a fiber art workshop sparked her own creative process. Judith spontaneously started creating the unique sculptures for which she is now famous. The art center was quick to recognize Judith’s talent and gave her the freedom to look for materials she wanted or needed. Only Judith knows what is inside many of the 200 fabric and yarn wrapped sculptures she so carefully and meticulously made. The story goes that at one stage they took X-rays and one sculpture even revealed a wedding ring! Over time Judith became a world renowned artist and her work is now shown in Outsider Art museums all over the world. You can read the full story on the website judithandjoycescott.com. Just make sure you grab some tissues as it had me in tears. Inspired by Judith’s art, which I first saw at the LaM in France and driven by my own love for all textiles, we set off to create our own sculptures. We had a little think about what we would wrap. And we wondered how Judith sourced her materials and what she would have looked for in an item. 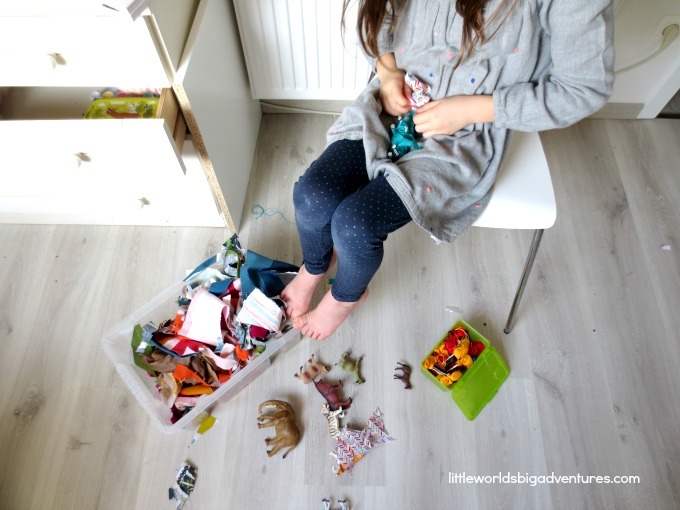 In the end we decided it was all about ‘gut feeling’ and we thought it would be fun to wrap some of our old toy animals. The symbolism of wrapping old toys and transforming them into art with your not-so-little-anymore daughter, wasn’t completely lost on me. There is something about wrapping things up that connects with feeling of care, warmth but also closure. Though 7 1/2 year old Miss Glitter simply had a great time creating alongside her mommy. I was surprised by her careful consideration of which fabric colour and yarn to use. And I realised how we all instinctively create until it feels ‘good’ or finished, just like Judith created intuitively. There’s no way you can overthink this like a figurative painting, this kind of art is what it is. And isn’t that the most liberating feeling? When we teach our children about art, we tend to stick to the big names of Modern Art: Vincent Van Gogh, Henry Matisse, Pablo Picasso, Andy Warhol, Mark Rothko and so on. I think that’s great, modern art plays a HUGE part is so much of what we still see around us everyday. There is more than just painting, there are so many different materials and ways to make art that it’s important to open that door once in a while and see what else is out there. And that is Outsider Art. Outsider Art is a whole different world of art waiting to be discovered by you. By definition outsider art is created by people who have had no formal artistic education and had no ties to the influential art world. These artists create from the heart and are not bound by rules or regulations, therefor much outsider art will be “out there”. There is a more to say about outsider art than I can do justice in a humble little article like this. So I’ll leave you to discover it’s beauty on your own. I do feel I should mention that outsider artists can have pretty intense life stories and work through some very explicit themes in their work. You might want to be aware of this before googling with your kids. The same can be said for modern art though, but I thought I’d quickly mention. 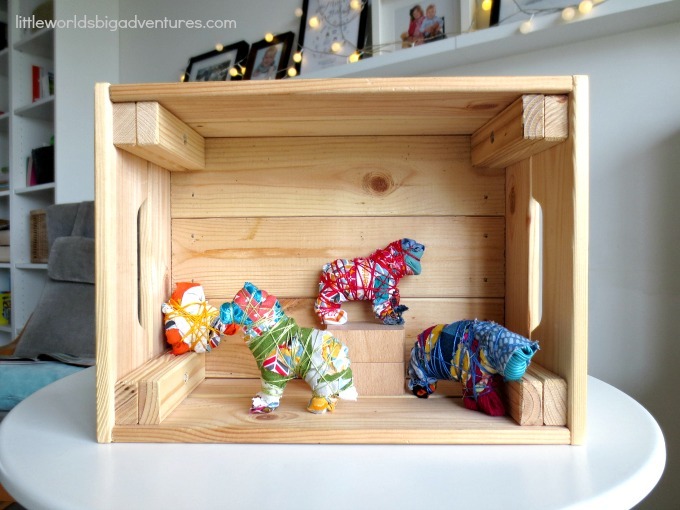 Thanks for reading, and be sure to have a look at this 35+ kid art projects: a creative walk through the history of modern, post-modern and contemporary art article. You’ll love it. Liked this post? You can pin it here. Visit Little Worlds's profile on Pinterest. Copyright 2018 Little Worlds Big Adventures * All Rights Reserved * No content or images from this website can be altered or used without prior permission. The posts on this website may contain affiliate links to Amazon. This means that at no cost to you I may receive a small referral fee if you decide to make a purchase on Amazon. Please use your own judgement to decide whether certain activities and/or materials are safe to do and/or use. Supervise your children when necessary.